It's definitely winter here. We have had a week of rain, rain, rain and temps dropping down to the 30's with wind chills of 20's. Not really my favorite weather for sure. I am beginning to think we will never see the sun again. I am not a fan of winter and it actually puts me into hibernation mode when it gets cold. So I have done nothing since Christmas. Today I am bringing you a Throwback Thursday post from a couple years. 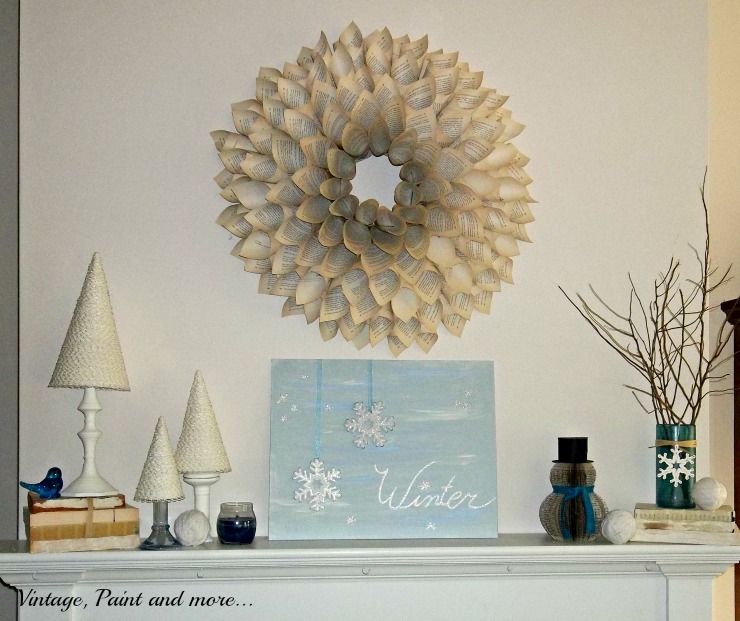 A Winter mantel that I had put together after Christmas with a lot of my Christmas decor I had not put away yet. (As you can see this hibernation mode is not new to me). 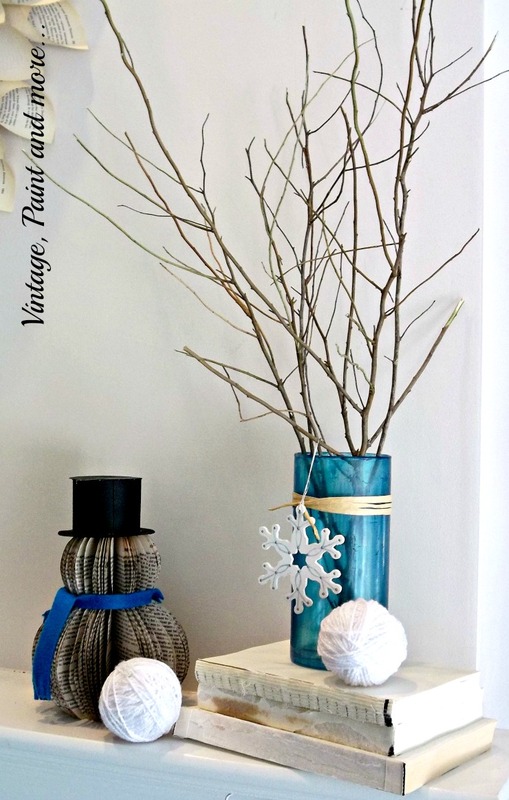 I used all blue and white items that I had either DIY'd, thrifted or already had. I love when I can come up with something pretty without having to spend any extra money. 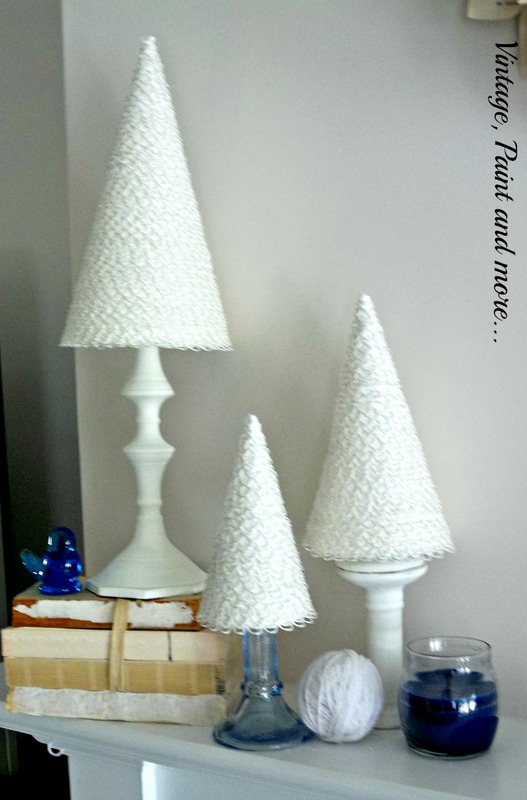 I kept my white cone trees out that I had DIY'd from buttonhole looping and placed them on some thrifted candlesticks. Standing one of them on a stack of old books sans covers then tied with raffia. 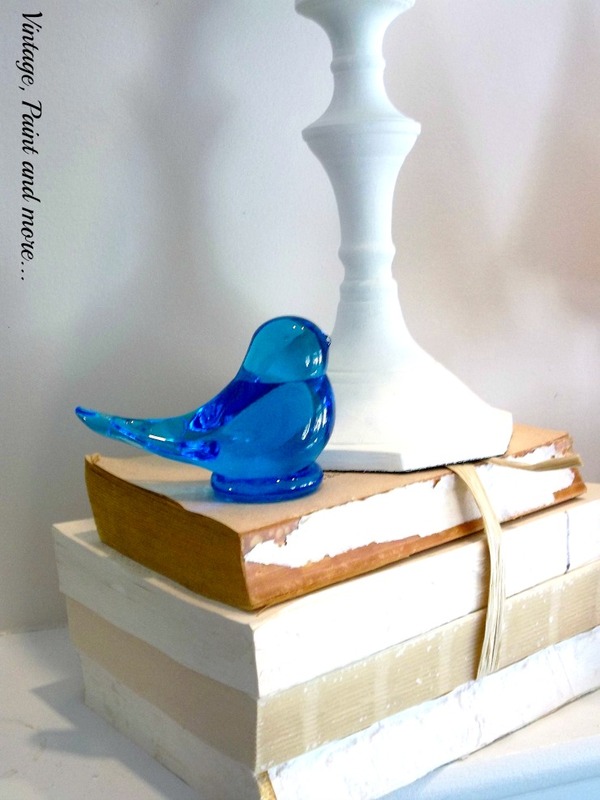 This little blue bird is quite special to me as it was one my Mother had when I was young. It always brings a smile when I walk past it so I always keep it out where I can see it daily. 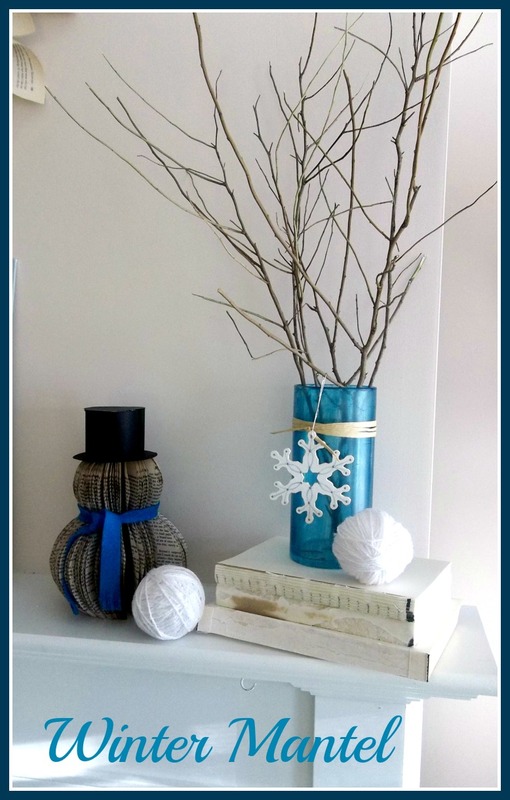 This side has a "faux" sea glass vase that I crafted from a Dollar Tree vase and then stuck some twigs from the yard in it. "Faux" snowballs made from Styrofoam balls wrapped with yarn were scattered about. 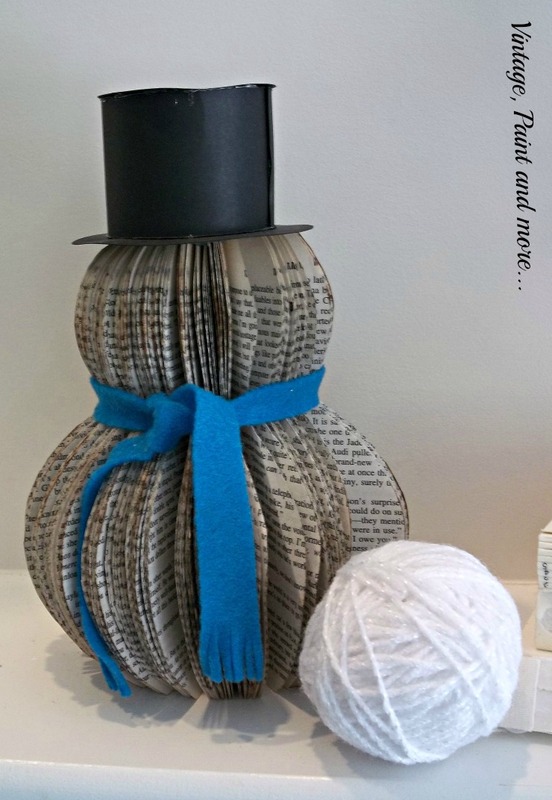 The snowman is made from a paper back book. 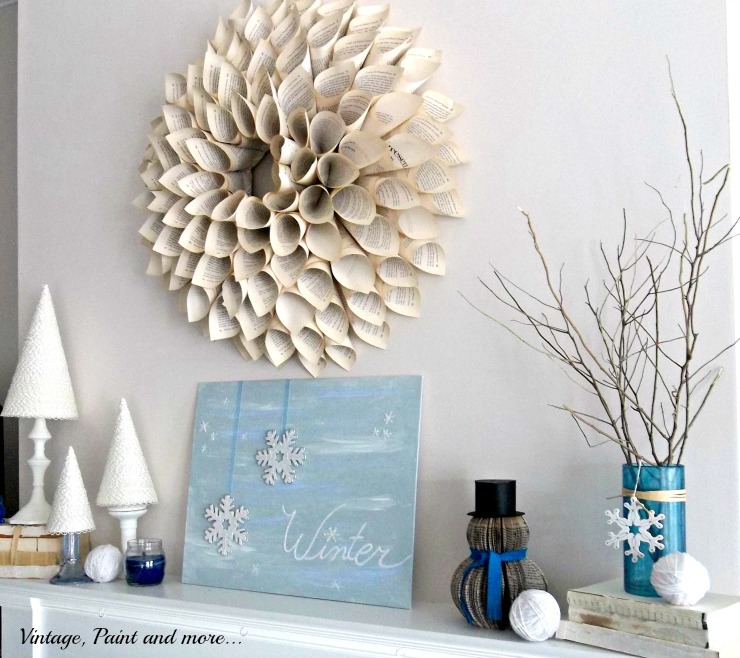 I love books and I love anything with words printed on it so book page crafts are a given for my decor. I am always looking for new ways to use them around the house. The center of the mantel is where I placed an art canvas I painted. I had not painted in quite a while and had a yearn to do so - so this is what resulted. It does kind of remind me of a winter sky in the Midwest. I was quite pleased with this mantel and enjoyed it until time to put up a Valentine one. 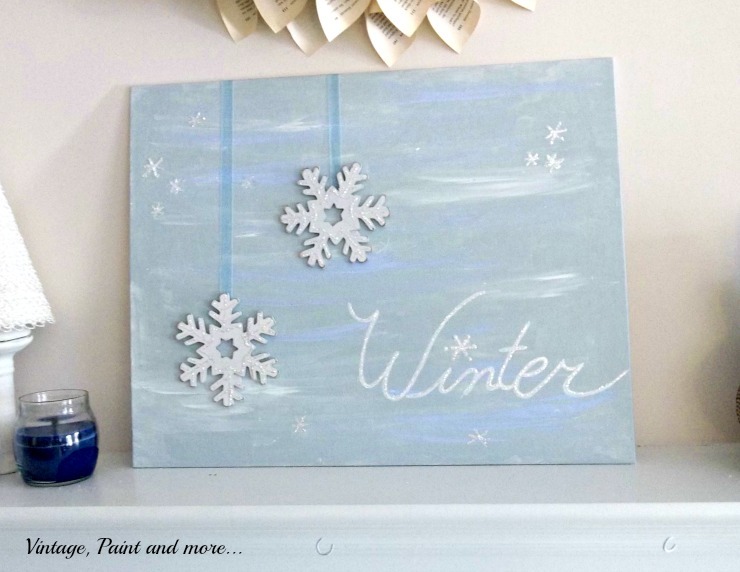 Do you put up a Winter mantel or just go straight into Valentine day or just skip both and go on to your usual mantel? Every year I have trouble deciding and this year is no exception so our mantel is completely bare right now and probably will be for a couple more weeks - at least until I get my motivation back again. 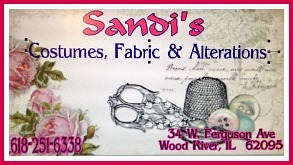 Thanks for stopping by and have a wonderful week crafting something you love. I will joining the parties listed on the Where I Party page above. 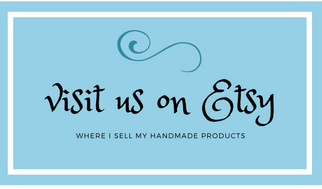 Please go by and visit - I'm sure you'll find lots of great inspiration and projects.